Hey remember back when Payne Stewart won the US Open? If you do, you're not only a big golf geek like me, but you also are old. (Sorry.) Remember how it was raining and he took a pair of scissors and cut off the sleeves of his rain jacket? That was so cool. Payne was just simply too cool. 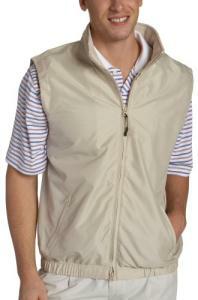 Well Greg Norman has solved that little sleeve issue, bringing you this stylish Men's Weather Essentials Full Zip Wind Vest. It will keep your core dry, but give you the full range of motion that you need when swinging a golf club. I like this product as you can always count on Norman's clothing line to be of good quality. If you live in the Northwest where it drizzles 9 months of the year, and you're a "mudder" like me, then a rain vest is a necessity, not a luxury. The only thing I might recommend is perhaps going with a darker color. Where I play, it gets pretty muddy out there, thus I like to go with darker colors that don't show the dirt as well.